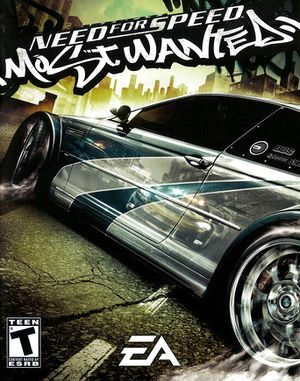 For the 2012 game, see Need for Speed: Most Wanted (2012). An alternative version of the game labelled Black Edition is also available which adds a number of exclusive bonuses. Patch 1.3 is the last patch for the game. Resolves a number of issues and is strongly recommended. Delete or rename attract_movie_english_ntsc.vp6, ealogo_english_ntsc.vp6, and psa_english_ntsc.vp6. If you have another language then the delete the file with your language instead, and if you have the PAL version the files will have PAL instead of NTSC at the end. ThirteenAG's fix requires the latest patch. See Patches. 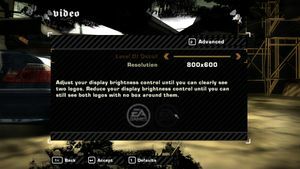 Use ThirteenAG's fix and NFSMW HUD Adapter. Higher frame rate is difficult to achieve on modern systems. Download Ultimate ASI Loader and extract it to the installation folder. Download RockportEd and extract it to scripts\ in the installation folder (create if it doesn't exist). Start the game and press Insert to show/hide RockportEd. Select the Camera Editor and adjust the FOV slider. Click on Save Preset to apply the changes. Other options such as camera height and vertical angle can also be adjusted. Extract scripts\ and dinput8.dll to the installation folder. Create wndmode.ini inside the root folder of your game installation. For bordered window change the line Border=0 to Border=1 (or add it if you haven't launched the game after creating the file) in wndmode.ini. Go to the configuration file(s) location. If you're using ThirteenAG's fix with WriteSettingsToFile = 1 set, open %USERPROFILE%\Documents\NFS Most Wanted\Settings.ini instead. Change the value of g_MotionBlurEnable from 1 to 0. For XInput controllers, use XInput Plus. 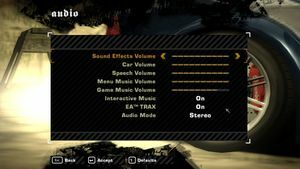 By default, game plays sound in 22 kHz. To change into high quality 44 kHz, set level of details to max (sometimes to level 3), and restart the game. This problem occurs because both games use the same name for their main executables (speed.exe). After installing one game and attempting to install the other, its autorun program assumes it's already been installed. 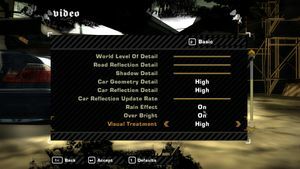 Deadzone can be adjusted in NFSMostWanted.WidescreenFix.ini. A set of code-injected fixes and improvements to the game's stability. On a PC with Intel GPU (or with Nvidia Optimus technology), the Shadow detail option is inactive. Right-click it, then click Set Affinity. Leave a checkbox on 1 with the other unchecked. Set options: "Disable display scaling on high DPI settings" and "Run program as an administrator". Change NoCatchUp = 0 to NoCatchUp = 1. 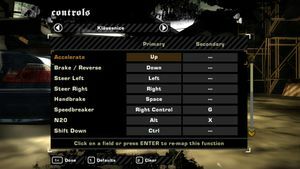 NFSMW Extra Options - Script mod which improves your gaming experience by many ways. High Quality Vinyls - A port of the high quality vinyls from the Xbox 360 version to PC. 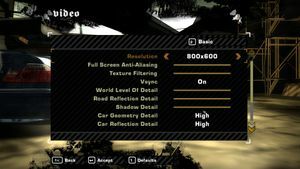 NFSMW World Controller - Can be used to change the camera, time speed, and HUD visibility. 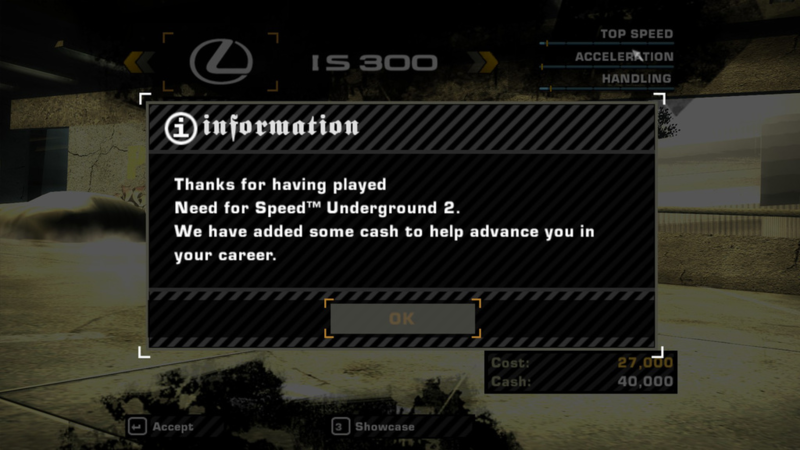 NFS Music Player - This is a custom music player replacement and a BASS library interface for NFS.